One of Boston's highest-profile robotics startups laid off employees for the first time earlier this week. 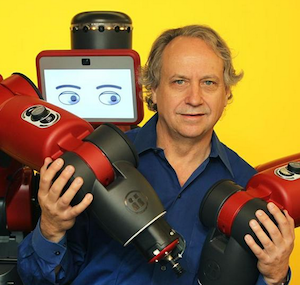 Rethink Robotics CEO Scott Eckert confirms that the Boston-based company cut 21 jobs, and says the company is offering outplacement assistance to those employees. Eckert says that the layoffs are the result of Rethink deciding to focus on the market segments that have been most receptive to Baxter since its launch, including plastics manufacturing, consumer goods, and warehousing and logistics. Rethink has also been selling Baxter to academic and corporate research labs in the U.S. and overseas. In an e-mail, Eckert explained, "Instead of a broad approach to the market that we have had in the past, we can now focus on the best segments of the market and continue to drive rapid growth with a smaller team. Our volume trends are encouraging, our customer pipeline is encouraging, and we expect to see significant growth in 2014, however we will be able to achieve that in a more focused manner with fewer resources. We are going to continue to make substantial investments in Baxter’s software and hardware to expand the robot’s capabilities and market reach, and we have some other innovations up our sleeve as well." LinkedIn shows about 90 employees working at Rethink, some of whom were likely part of this layoff, so it's a significant reduction for the company's workforce. Vice president of product development Elaine Chen has also departed the company, but Eckert said that was unrelated to the layoffs. "She has a number of other interests she wanted to pursue, but [we] wanted to make sure we got through the 2.0 release of Baxter’s software, which was a major capability upgrade and market expander for Baxter," he explains. Chen confirms that the timing was "actually coincidental," and says her departure had been "in the works for a while." Rethink has so far raised about $75 million in venture capital, much of it from local firms like Charles River Ventures, Sigma Partners, and Highland Capital Partners.